We don't take snacking lightly In fact, you could say we're obsessed. We cooked up 220 varieties of potatoes until we found the exact right perfect one. We hand cook these beauties in small batches for a delectable crunch, coat them with a kiss of salt and then hoard as many bags as we can. If you're as passionate as we are, we might just share. 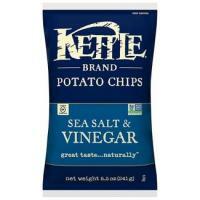 Our family loves these chips. We eat several bags a week.